Bancha is Japan’s second most common Green Tea and is characterized by a high content of minerals and trace elements (especially iron). Bancha in Japanese means (番 茶) usually for “ban” and tea for “cha”. 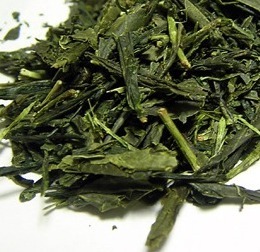 After Sencha, it is the second most drunk Green Tea variety in Japan (about 10% of production). Bancha has two origins. Firstly, the Japanese word “ban” (jap . : 番) can be understood as “everyday” and “common” and can be found in words like Bangasa (Japanese umbrella made of bamboo and washi paper) and Obanzai (home cooking in Kyoto). The multi-purpose nature of this tea probably led to the creation of its name. However, one other theory is that the name originates because in most cases older and coarser leaves are used when harvesting tea. The second meaning of “ban” (jap. : 晩; same pronunciation, but different characters) in Japanese is “late” and points to the late harvest. In the same vein, the “ban” in the terms Ichibancha (first crop), Nibancha (second crop) and Sanbancha (third harvest) is used. According to tradition, the majority of Bancha teas became popular in the middle of the Edo period. Only by technical advancements and subsequent standardization was the more refined Sencha and other green tea varieties created. Therefore, today there are many different forms of Bancha-production, mainly characterized by regional differences: from the simple drying of harvested leaves to fermented versions that resemble more Chinese teas. The term Bancha has in Japan, different meanings depending on the region. In the eastern part of Japan (Tokyo) it’s used to represent the coarser Green Tea harvested in the Autumn, which corresponds to the Akibancha (秋 番 茶). In western Japan (e.g. Kyoto), the term refers more to roasted green tea, also called Houjicha or Hojicha (see end of article). This tea also contains the larger leaves of the tea plant that are harvested a little later. These tea leaves are named Yanagi before roasting to Houjicha. Bancha is extremely popular in Japan as a simpler everyday tea. It is normally drunk after a meal or to aid digestion. It has significantly less caffeine than Sencha or Gyokuro and therefore good for people sensitive to caffeine and of course it can also be drunk well at night. For strong caffeine sensitive people, the variety Karigane / Kukicha evening is better suited. See the article caffeine in mg which compares the different varieties. Bancha typically has a slightly grassy pleasant flavor and is often highly regarded by green tea beginners. It is important to note that the tea has little to no sophistication or refinement, as in the case of Sencha or even Gyokuro. The Sencha is by far the more popular Green Tea amounting to nearly 80% of Japanese production volume. Sencha has a tremendous quality range from low to absolute top class. Best Senchas can even be compared to the top Gyokuros. 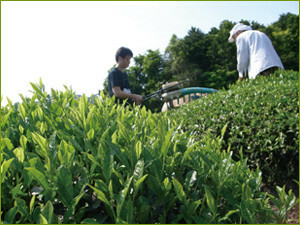 However, the character, taste, ingredients and effect of Sencha are very different to Bancha and have little in common. Good source for minerals / trace elements and in particular iron (especially suitable for vegetarians / vegans and women in menstruation)! See also the article Green Tea and Iron Deficiency. A quality Bancha includes about 30 to 40 of the 50 rare trace elements needed by the body. Above all, it has relatively high levels of certain minerals. With approximately 38 mg iron / 100 g of Bancha tea, it makes one of the strongest iron foods. Very good effect on digestion through the numerous and intense tannins (digestive stimulant). Bancha is very basic and a strong anti-acid! Bancha is also suitable for drinking when suffering from a sensitive stomach and intestinal mucosa (as opposed to Sencha and Gyokuro), even has a positive effect on this. Compared to Sencha / Gyokuro it has less than half of their caffeine levels, but still more than twice as much as Kukicha / Karigane does. Pregnant and breastfeeding women can drink small amounts Bancha daily. Much of the human body’s required mineral intake / trace elements. Of the roughly 50 required essential and rare trace elements, one can per week by drinking 0.5l (2 tsp) of Bancha, consume about 30-40 trace elements. This cannot be achieved with many foods! Iron: particularly high proportion of very bioavailable iron. By simply drinking Bancha twice a week, you can significantly increase your iron intake (more infusions can also aid in diseases and in menstruation). Tannins: Many important phytochemicals that have numerous positive effects on health, but to a lesser extent than in Sencha or Gyokuro. From a health perspective, we recommend the same preparation as in Sencha or Gyokuro, i.e. exactly 2 minutes brewing time at a temperature of 55-60 degrees Celsius. To produce Hojicha mostly simple Bancha leaves are used (but also partly Senchas) that are roasted at about 200 degrees Celsius and then cooled directly. Through roasting Hojicha reaches a brownish color and bitter character. It can be tolerated when “warm” and has a special effect against stress and weakness.